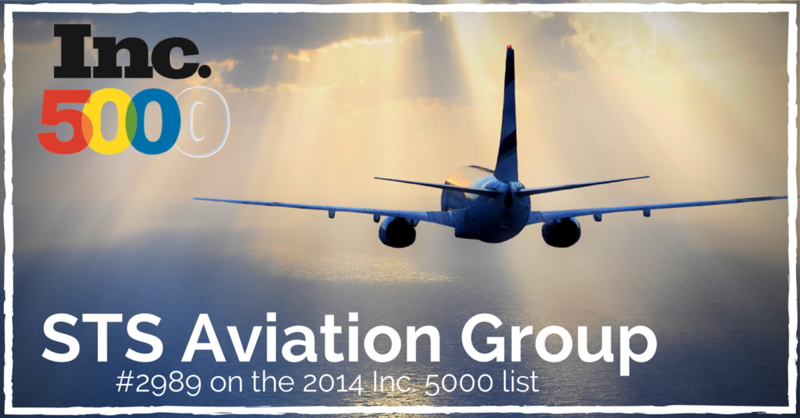 J ensen Beach, September 9th, 2014 — STS Aviation Group is proud to announce that it has landed the 2,898th spot on the Inc. 5000 list recognizing the fastest growing companies in the United States. In the past three years, STS has added more than 280 new corporate jobs and experienced a 126% growth rate. In 2013, annual revenues topped the $165 million mark with projections expected to exceed that total in 2014. “The growth we’ve experienced these past few years has been incredible and stands as a true testament to the hard work and dedication our employees, managers and executive teams put forth day in and day out,” says Mark Smith, President of STS Aviation Group. With headquarters in Jensen Beach and Palm City, Florida, STS boast a strong global foothold in the aerospace industry with numerous sister locations spread throughout North America, South America, Europe, Singapore and Asia. For more information about STS Aviation Group and what makes it the company with “Solutions to Keep You Flying,” visit http://www.stsaviationgroup.com/ or call 1-800-800-2400.